Timezone is an important setting in this page. ASP.NET Zero can work in multiple zones. Each user can see dates and times in their own time zone. Timezone setting in this page allows you to set default time zone for the application including all tenants and users. Tenants and users can change time zone in their own settings. Timezone setting is available only if you are using UTC clock. See documentation to switch to UTC. SAVE ALL button saves all settings in one click. HostSettingAppService is used to retrieve and save settings (See setting provider section for more information). 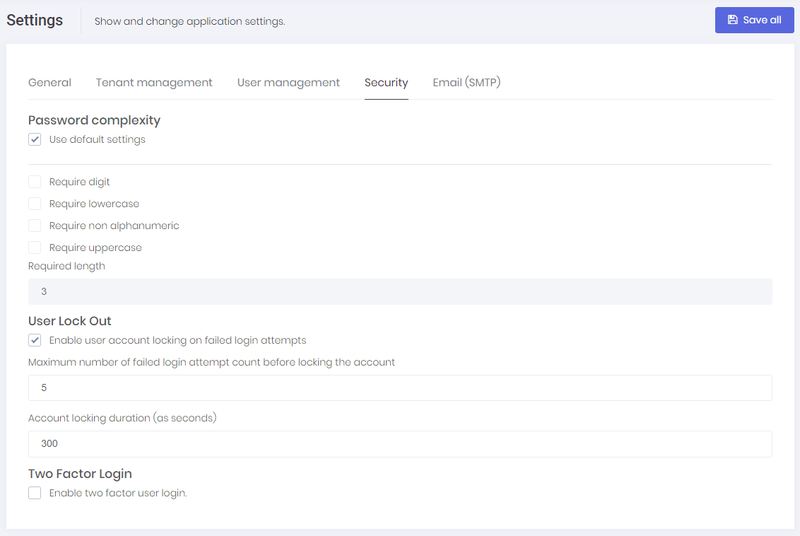 Security tab in host settings page contains password complexity and other security settings. Host can define system wide security settings in this tab. Each tenant can override this setting in tenant settings page. PasswordComplexityChecker class is responsible for checking if a password satisfies the password complexity settings. Email(SMTP) tab allows you to configure smtp settings for your app. AspNet Zero uses MailKit to send emails. By default, smtp certificate validation is disabled in YourProjectNameMailKitSmtpBuilder.cs class. If you are able to validate mail server's certificate, you need to modify ServerCertificateValidationCallback in YourProjectNameMailKitSmtpBuilder.cs. If you want each Tenant to configure their own SMTP settings, you can go to YourProjectNameConsts.cs which is in *.Core.Shared project and set AllowTenantsToChangeEmailSettings to true. In that way, each tenant can configure and use their own SMTP settings.